The Federal Reserve Could Boost Employment and Investment. Here’s How. Anyone on the left should support directly setting long-term interest rates. The right is pretty clear on what it wants to do with the Fed. Ted Cruz openly talked in a presidential debate about bringing back the barbaric relic of the gold standard, and the House GOP wants to tie the hands of the Fed, preventing it from doing anything. The left is less clear. Though there have been some notable exceptions, like the activists in the Fed Up campaign, the left has generally lacked a clear and specific agenda for the Federal Reserve. Some have assumed that the Fed’s actions after the 2008 crash benefited banks, ignoring the pretty clear lobbying that the financial industry has done recently to raise interest rates. Some have assumed that the Fed’s low interest rates have hurt people who save or encouraged risky investments, implying that capital deserves a level of return independent of how the economy is doing. The left has generally lacked a clear agenda for the Federal Reserve. Here’s what we need. In a few weeks, Federal Reserve chair Janet Yellen is likely to start raising those interest rates, signaling that the Fed wants to start cooling the economy. On the left, we must understand that this is the wrong move, as there are no signs that the economy is overheating: Growth has been modest, and we’re at no risk of dangerous inflation. There is a palpable sense of relief, since many see raising interest rates as the beginning of the end of a tough time for the economy and for the Federal Reserve. Finally, people hope, we can put the Fed’s difficult questions behind us. But the Great Recession wasn’t a one-off event, the kind that’s inevitable every few decades. It reflects a new period, one where all the signs point to an economy prone to sluggishness and weak demand. This is a moment to expand and formalize actions that the Fed will need to take in the future. The Federal Reserve controls the money supply, and it normally sets short-term interest rates to facilitate full employment. The short-term rate influences the long-term rate that businesses use for investment and employment, because the long-term includes within it the short-term. Lowering those long-term rates sparks investment and employment and eases the burden of debt, benefiting workers in a weak economy. However the short-term rate has become stuck at zero. The Fed can’t lower it any more. As a result, it has taken extraordinary actions in this crisis, such as buying long-term government debt and mortgage debt in an attempt to influence those long-term interest rates, a process with the unlovely name “quantitative easing,” or “QE” for short. Doing this is also meant to lower long-term interest rates, helping spark a growing economy. Instead of retreating from QE, the Federal Reserve should be formalizing it as a tool. 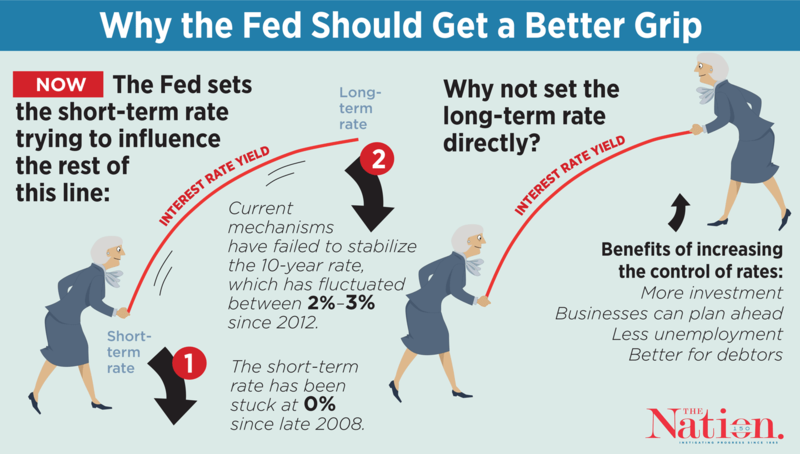 The Fed should also be prepared to go further and directly set long-term interest rates. It’s the same process as QE, using the same mechanism. The Federal Reserve can easily declare a rate and then buy the amount of debt necessary to achieve it. It may not have to buy very much, just as it currently doesn’t have to buy much debt to influence short-term interest rates. To quote John Maynard Keynes in The General Theory of Employment, Interest, and Money: “A complex offer by the central bank to buy and sell at stated prices gilt-edged bonds of all maturities, in place of the single bank rate for short-term bills, is the most important practical improvement which can be made in the technique of monetary management.” Don’t just set the short-term rates, but set the long-term ones as well. The left in particular should embrace this tool as an essential part of reform. Practically speaking, it benefits workers and debtors; ideologically, it says that money isn’t just about protecting the wealth of the rich but also, through building worker power and investment, about ensuring that the economy is growing for everyone long-term. In addition to a higher inflation target, which would give the Federal Reserve more room to maneuver, and changing its governance so that it is less dominated by banks, setting long-term interest rates is a clear way of boosting employment, investment, and worker bargaining power. These reforms weren’t undertaken in the crisis. But, unfortunately, we’ll get another chance soon enough.